This month, we have heard from two British writers, Pat Neil and Allan Massie (left), discussing two sites that retain traces of reality and metaphor; that are removed from us by history and made close by memory – Massie on di Chirico’s Rome, and Neil on Franco’s Madrid. These sites remain real – the cities exist. Although it is hard to say if they exist as Massie and Neil perceive them, if they ever did, or if they only ever have. Thus, they also are imbued with heavy symbolism and metaphor, through our understanding of history (Neil’s ‘stranger in a strange land’ storyboard, Massie’s art-as-social-historian motif) that recreate and reconstruct our understanding of place and memory. Certainly, Madrid and Rome are physically (and temporally, in this case) removed from the writers’ current places of home. Both writers reside in the Borders of Scotland, itself a boundary-land between Scotland and England. But in these recent pieces for New Linear Perspectives, Massie and Neil have created a new border-land – an in-between space that does not heed time or place but rather exists as a crucible for our understanding of both writer and subject. This space is a matrix; a palimpsest of temporal layering. 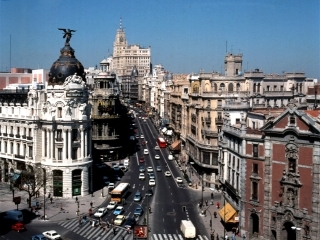 Take Neil on Madrid: her Madrid is a place of rationing, poverty and decay – hardly the metropolitan bright lights we see today. Neil’s narrative manipulates a current understanding of Madrid by replacing it with the Madrid of fifty years ago. By doing so she also suggests a Madrid in fifty years time. The decaying building (that now might stand replenished and renewed, although in another form, or merely traced on the landscape) is also the crumbling image of that building in its heyday. Neil acts as a cipher for the telling of Madrid’s story, or the continuing story of the physical space currently called Madrid. It would be rather whimsical of both writer and reader to view Neil’s historical document as merely that, a historical document. It should, rather, remain unresolved. If, as Juan Velasco says, history is used to tell the ‘present fabric of the social’, then both Massie and Neil are using this ‘in-between’ space to tell us something about ourselves, and about our own time. This again reflects the temporally ambiguous nature of storytelling, and places us as reader in a border-land all of our own. How do we resituate the histories of Madrid and Rome through the narratives of Massie and Neil? Massie mentions Roman favourite the Caffe Greco, reportedly the haunt of Casanova, Goethe, Wagner, Stendhal, Baudelaire, Shelley and Byron. But it is equally a place of suggested literary daring as it is a place of tourism. From his (theoretically, at least) temporally unfixed home in the Borders, Massie remembers a place called Rome of forty years ago, when the caffe was a potential meeting place for writers and journalists. Such places have existed in many capital cities. Their nominal existence is usually only discovered in the future – that is to say, when they are lost, in the past. And where their existence is lauded, it is also denied. The physical building of the caffe is now a Mecca for tourists, (perhaps future writers), who hope to be imbued by the metaphor and symbolism of the place. Massie himself “wrote short stories there, as if I was playing at being Hemingway in a Paris café in the Twenties”, capturing some of its imagined past or the imagined present it projected for him. The irony is that personal history is never physical; as Neil’s piece suggests, it is ephemeral and aesthetic, of the emotions. 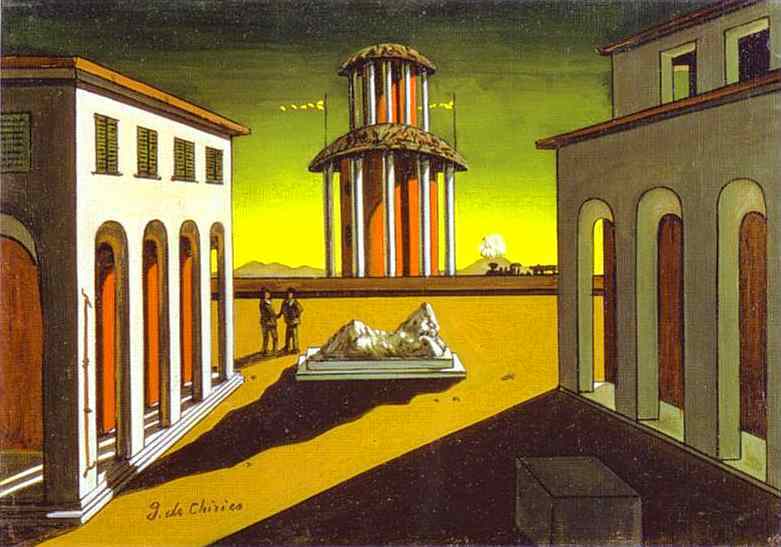 Massie, di Chirico et alia manned a creative space that is now only the image of ‘the literary salon’; this is something di Chirico would perhaps have appreciated, dealing as he did first with metaphysical images – non-places, hyperreal scenes – and later inhabiting an artistic border-land so removed from many of his peers and critics. This layering of realities, or chain of reminiscences, is highly positive. It gives us a new space, which is fitting for New Linear Perspectives, hanging in the ether of the internet – neither physical nor tangible – like our own understanding of history. The space suggested is a counterdiscursive space that unpacks our journey-bag of historical presumptions and helps define our roles as writers and readers. This seeming lack of theoretical clarity is a good place for New Linear Perspectives to start. Placed on this multifaceted matrix of the past, New Linear Perspectives imagines a space for the future, and like the book it never was helps refigure this future by clarifying the present. 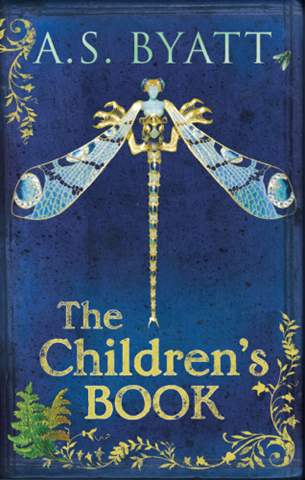 Take A.S Byatt in her recent (and I think, very good) work,The Children’s Book. She picks over the late nineteenth and early twentieth century with a fine tooth comb, helping the reader to inhabit the ambiguity of the past and rejecting more traditional perspectives that are temporally fixed. For her characters, “time passed at different speeds… For some it ticked like metronomes, for others it lurched giddily, for some… it still resembled space, boundless and sunlit, boundless and shining… always offering corners to go round, long, long roads stretching ahead”. Concepts of the temporal in Byatt’s work suggest the fluidity of time and memory, something foundational Argentine writer Juana Manuela Gorriti describes as “an endless chain of memory… resuscitating the past and reconstructing what has faded away”. Memory is the fabric of time, and traditional temporal boundaries of past, present and future become obsolete. Madrid and Rome are merely symbols of our desire to unpick the past, and Massie and Neil ciphers for the telling of our stories into the future. Massie and Neil also present us with a death – Neil with the heavy symbolism of death that accompanies Franco’s Spain, and subsequently the death of her Madrid, and Massie with the telling of di Chirico’s posthumous story, perhaps also the death of Massie/di Chirico’s Rome, or the space that they called Rome. This border-land of the symbolic dead, memory’s land of purgatory, suggests the end of the story. It is also, then, the beginning, introducing a relentlessly circular function to time, and an active and reactive dimension to theory as espoused in this essay. This ambivalent and reflexive thought process allows us to be unresolved in a permanent state of questioning irony; temporally, physically, virtually and literally we are fixated in a constant state of flux.